After all that time, after all the hype, after all the message boards and corresponence bettween Macromedia developers and flash animators; flash 8 was released this week and what a dissapointment. Nothing has changed in my eyes, at least nothing worth noting as far as animation production has gone. Timeline effects are garbage. Layer options are cool but only work on movie clips which means a no go for avi or image sequence ouptut. Sound editing is still useless. Even the instance type box is still only 2 characters wide! WHAT THE HELL?! What happened to 8-BALL being all about the animation!? What happened to all the hype!? This moment is matches, hell exceeds my dissapointment with flash 7. It seems to me that still the best version of flash is flash 4. It hasn't changed all that much for the animtor since. 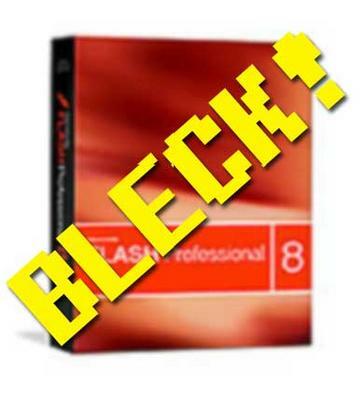 Flash 5 made things more difficult, flash 6 had minor upgrades that were useful, flash 7 is a pain and now flash 8 is a slight upgrade to the pain, making it worse not better. I'm trying my best to find something useful and positive with flash 8. If I've overseen something please let me know, I'm dying to find out. Here's something I didn't know, it looks like the undo problem is fixed, worth the money for this? hmm.. no.